— Slightly blanch the rapinis and swiss chard separately. Cool and chop coarsely. — Meanwhile, cook the pasta in a large pot of salted boiling water. Make sure that it is «al dente». — In a large skillet, combine olive oil, garlic and red crushed pepper. Cook at medium heat until garlic turns golden (be careful not to burn the garlic, it will become very bitter). Add the greens and sauté for 2 minutes. Deglaze with the tamari and continue cooking for 1 minute. Add the chicken broth and set aside. 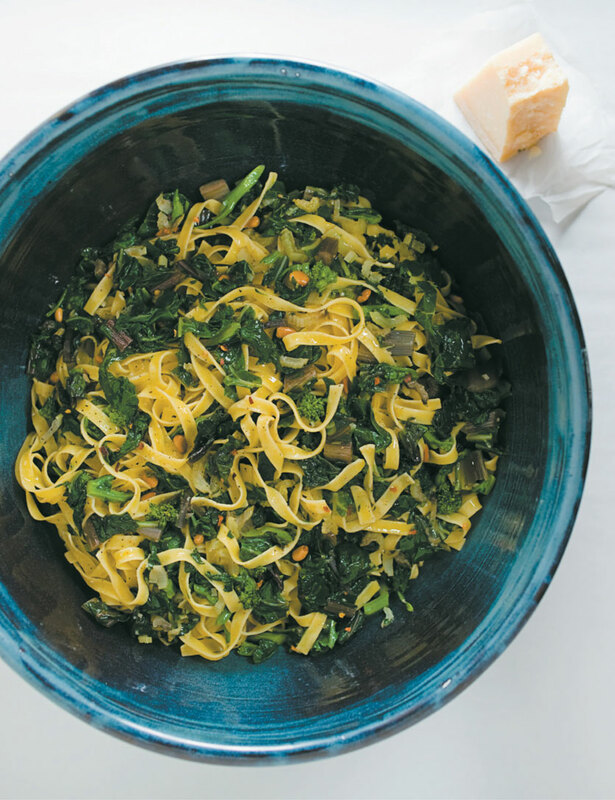 — Once the pasta is ready, strain it without rinsing and pour in the large pot with the greens. Toss well and reheat for few minutes. FINALE — Add a drizzle of olive oil, sprinkle some Parmesan cheese and pine nuts, and add a touch of fleur de sel and pepper. Serve with lemon wedges to enhance the flavor. A little touch of Quebec — Add some snails or shrimps at the same time as you sauté the garlic. Replace the Parmesan cheese with our superb Ciel de Charlevoix… I promise, you will make this recipe week after week!